I promise, one of these days I will get the hang of preparing healthy and nutritious meals from scratch every day, every meal. It’s a major life goal, really. But right now with a very active toddler on the go every minute of the day, it’s not happening. I’ve been resorting to keeping easy to heat and grab stuff for me during the day and trying not to cave and hit the drive through on the way home from play dates. 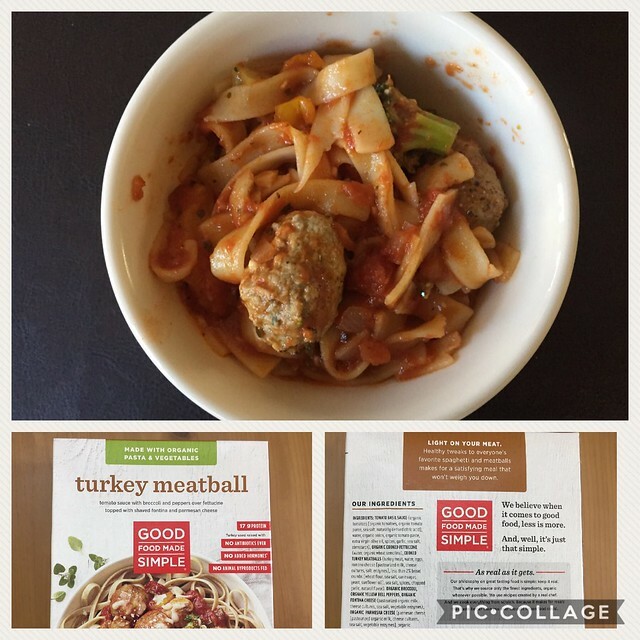 When the folks at Good Food Made Simple contacted me about reviewing some of their frozen meals, I was all over that. I’ve tried the Chicken Chorizo Cafe Wrap before and liked it, so I was excited to try these new meals. I like that the ingredients lists have REAL ingredients and that the meats used don’t have any antibiotics or hormones added. It makes me feel little better about eating a frozen meal! As you can see there was a nice mix of cuisines available – Asian, Mexican, American/Comfort food. I grabbed a few I thought my husband would like as well, since he sometimes eats frozen meals if he’s home late or I was just too lazy to cook (it happens a lot!). I apologize in advance for the less than stellar pictures, I tried these out during my son’s nap and was trying to eat lunch AND catch up on my TV shows. Multi-tasking, people. First up was the Turkey Meatball meal. As far as frozen pasta meals go, I think a lot of them tend to use too much red bell pepper in their sauces which I’m just not a fan of. The meatballs themselves were decent and I was happy to see at least 4 in there, usually you get short-changed on the meat. I liked that there was broccoli, since that’s something I usually end up adding when I make pasta. I think it could have benefited from some more herbs or flavor in the sauce, but overall this wasn’t bad! Next up was the Three Pepper Beef. This one looked SO good, I’m a sucker for spicy Asian food. 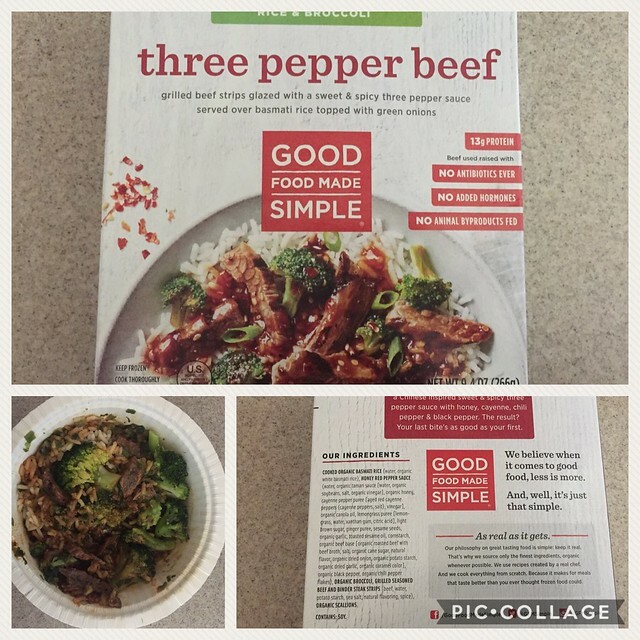 Usually I’m so disappointed in the sauces for frozen meals, but this one was actually spicy and not too sweet. I loved the hit of ginger and lemongrass, it gave it a fresh taste and some zip. I got one of these for Mr. Spice to try and he noticed the same thing. We’ll be getting this one again for sure. Lastly we have Chicken Pad Thai. 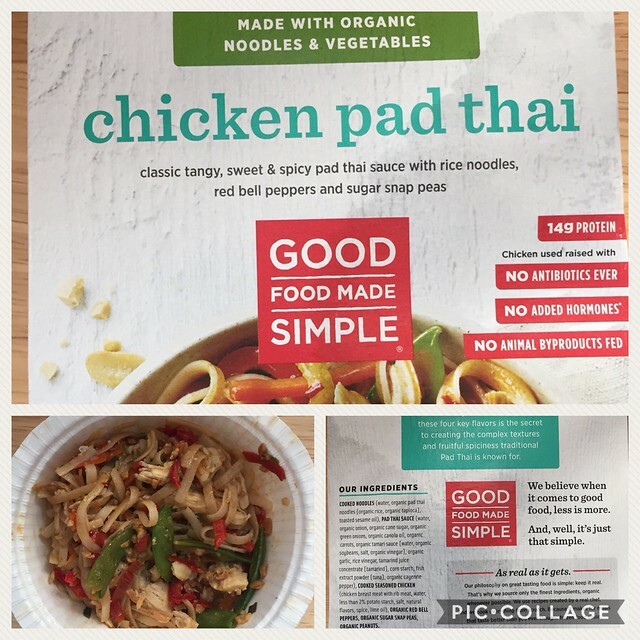 Encouraged by the Three Pepper Beef, I was excited to try this one – I adore Thai noodle dishes. Unfortunately, this one was my least favorite of the three meals I tried. The first thing I noticed were all the chopped up peanuts. I know Pad Thai is topped with chopped peanuts, but I felt that the amount was a bit too much and the smell of nuts as the meal was heating was overwhelming. I’d suggest they include the peanuts in a separate packet to be added on by the consumer after the meal is heated. I’m hoping to hit up a couple other Target locations to see if I can track down a couple other meals that looked good on the website – Lemon Chicken (Greek-style, with Kalamata olives and lemon peel pasta!) and Hatch Chile Mac. Oh and the Pancake Puffs look like something my son might like, so that’s going on my list as well! If you happen across these and are curious, I say give them a try! 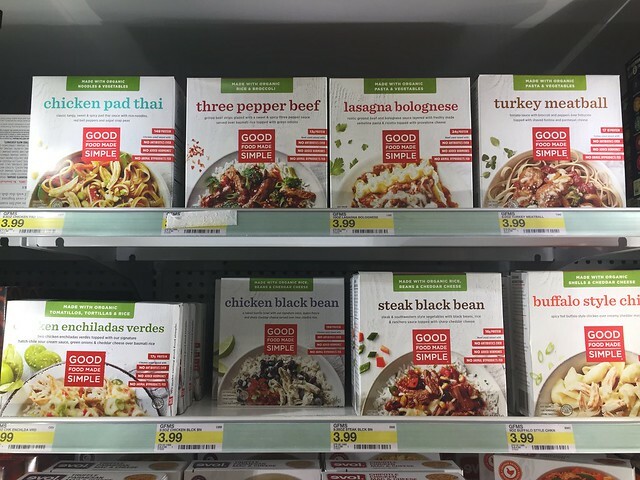 Disclosure – Good Food Made Simple provided me with a Target gift card to purchase these meals but I received no other compensation and was not obligated to provide a positive review. All opinions are my own. Previous post: Celebrate World Penguin Day with Stonyfield!